Treat Mom! The Greatest Showman (Blu-ray + DVD + Digital) $15! Perfect for Mother’s Day! Nutri Ninja™ Pro Blender 60% off Shipped (or email it)! Whoa Baby! 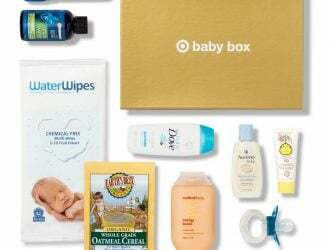 Grab the Target Baby Box for ONLY $5 Shipped! Check this out! KitchenSmith by BELLA 6QT Manual Slow Cooker ONLY $12! Toddler Clothing as LOW as $2 with Free Shipping! Rubbermaid 34 Piece Food Storage Containers Set ONLY $7.00 + FREE SHIPPING! Target Doorbusters are Live NOW! How to get EARLY Access to Target Black Friday Deals! Target Cyber Monday 2017 Sales! Plus 15% off Sitewide! PlayStation 4 Black Friday Deals! Grab it for as low as $189.99! Target: 30% off Zoomer Pets & Meccano Toys! Today Only! Military Members & Families get 10% off at Target! Online and in Store! FurReal Roarin’ Tyler the Playful Tiger ONLY $70.49! Reg $130! Black Friday Early Deal! Hoover® WindTunnel® 2 Vacuum ONLY $69.99! Reg $130! TOP TOY DEAL! Doc McStuffins All-in-One Nursery ONLY $47.24 at Target (Reg. $79.99)! HOT! Baby Alive Doll ONLY $7.19!